Brie Larson plays Carol Danvers, the half-human and half-Kree being who becomes Captain Marvel. Larson deserves it. She’s on the nth leg of her world press tour for Captain Marvel, and despite being in the industry for 20 years, this is probably her first rodeo when it comes to megamillions superhero tentpole films. The day before she was at a fan event, signing autographs and taking selfies with hundreds of fans (like a true pro, she makes sure she holds the camera) and tirelessly stopping and repeating the same answers to the press on the red carpet. While all this happens I’m just appreciating the reflection of her enjoying her epic cake against the TV monitor. I adore Brie Larson. She first caught my eye when she played two villainous roles in succession: Envy Adams, Scott Pilgrim’s rocking ex-girlfriend (in Scott Pilgrim vs. the World), and Cassidy, Miles Teller’s bad cheerleader girlfriend in The Spectacular Now. She was supposed to be the bad guy (girl? ), but in the former she was awe-inspiring and in the latter she was the most sympathetic character. Then came Short Term 12, one of my favorite movies of the decade; and then, of course, Room — which won her an Oscar. There is something about Larson; how she is so girl-next-door that you almost forget what she looks like but also so disarming and honest in her performances. And now, she’s playing the most powerful hero in the Marvel Cinematic Universe: Carol Danvers. In the ’90s-set Captain Marvel, Larson’s character goes through a personal journey discovering herself and her past while trying to prevent a secret war between the Kree and Skrull alien races on Earth. In our brief interview she discusses the perils of starring in a major franchise, directing her own movie, and a quick nugget of life advice. SUPREME: I saw an interview with you before, around the time of Room, where the interviewer said “I want you to be Captain Marvel” and you went “Oh, who’s that?” If you could contact Brie 2017, what would you tell her? It all just feels super-surreal. It was something I had talked about with Chris Evans ‘cause he was kind of getting me prepped for all this and I said, “Does it ever, like, sit in you? Do you ever feel it?” and he was like, “No, the whole time it always just felt like it was happening to somebody else,” and I really understand that. It just feels like I’m along for this journey but I don’t even understand it. It’s just so wild. Out of this movie? I think there’s so many small revolutions in this movie. I mean, there’s the fact that this is a super empowering and strong character. The fact that she owns herself in a way that we don’t see as frequently as I’d like to see, on camera. The fact that her big love story is with her best friend — her female friend, which I find really beautiful. And there are also little things too, like she doesn’t apologize for herself. You don’t get to see someone who’s like “Oh sorry, sorry, am I too strong? Sorry, am I making you feel bad?” She’s just owning herself. As a director (Brie directed soon-to-be-released Unicorn Store), what have you learned from Anna and Ryan that you can practice in your own projects? Well, that’s like... one of the things I’m constantly learning on every job — and I’ve been doing this since I was a kid since I always wanted to direct — is that I ask a ton of questions. I’m constantly asking questions. And on Captain Marvel one of the things that I learned, and that I got really into, was the visual effects because that was something that I hadn’t been on before. We did it a little bit on Kong: Skull Island but it wasn’t as much as this where I’m, like, there all day every day and so I was able to learn, like, a whole new world and to learn how to bring heart and performance into something like that. That’s what most of my conversations with Ryan and Anna were about: yes, we’ve got explosions and aliens and spaceships but how do we make these scenes between two people really feel like it’s intimate and matters. Speaking of directing, when is Asia going to get to see Unicorn Store? Uhhhh, I think — oh. You’re right. I think it’s just China and somewhere else that doesn’t have Netflix but otherwise it’ll be on Netflix April 5! All right. Last question: can you give us 15 seconds of life advice? 15 SECONDS OF LIFE ADVICE?! I don’t — I don’t have life advice! Be — it’s just this simple — BE. YOURSELF. I mean, I think it’s like the most obvious thing but it really is everything. 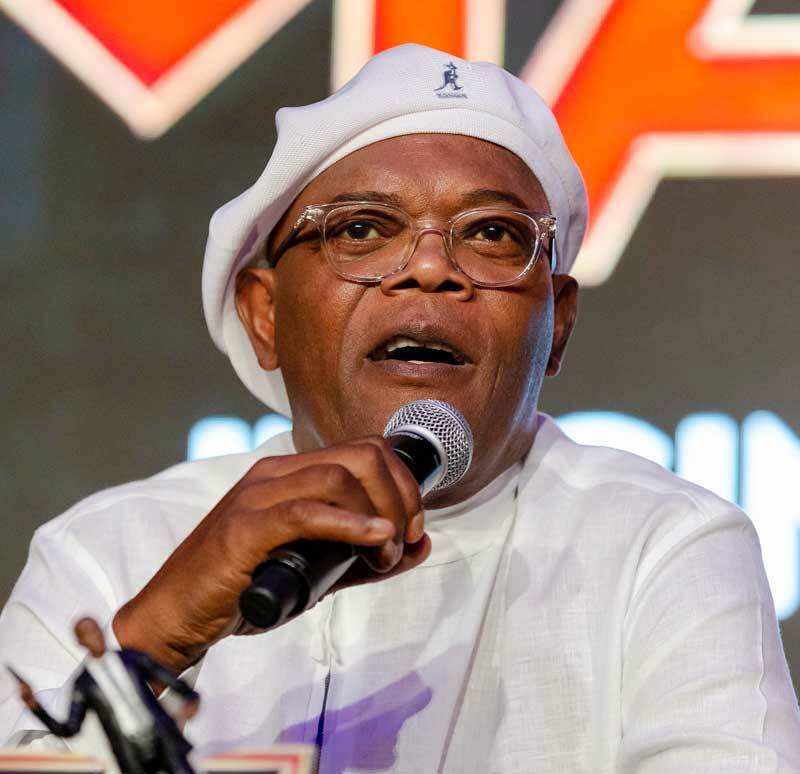 Samuel L. Jackson reprises his role as Nick Fury, whom he has been playing since the first Iron Man film. SAMUEL L. JACKSON IS 70 YEARS OLD. Just let that sink in for a minute. The most badass character in the MCU should be using a walker, and yet here he is reigning over all the superheroes in and heading S.H.I.E.L.D. He’s also got lots of personality, and to quote his character Jules Winfield in Pulp Fiction, “personality goes a long way.” Unlike Brie Larson he’s very comfortable in this press tour, so comfortable that he looks kind of bored. But there’s a charm to that, and there’s a charm to him when he brushes aside questions and cuts me off. It almost feels like he just wants to have a conversation, and my nervousness at interviewing one of my favorite actors ever just melts away. So what year, Sir, is Captain Marvel set in? (Laughs) Because I’m trying to… like, what Sam Jackson is this? Is it True Romance Sam Jackson? Die Hard with a Vengeance Sam Jackson? Like, which of your performances did they pattern you after? It looked like — it looks like, ummm… The Negotiator phase. That’s a really good film. It’s been 45 years since Together For Days. You mean since the first film I did. Haha. Well, since then you’ve played so many classic characters — Mace Windu, Mister Glass — which characters are the favorite ones you’ve played? All of ‘em. (Smiles) I mean, I like ‘em all. It’s an interesting sort of year this year because I went back to Elijah Price — Mister Glass — and at a certain point this year I go back to Shaft, which is the same amount of time; it’s like 20 years. So yeah, those two characters have been apart for a while and all of a sudden they’re back at the same time this year. Well, there are things that happen around him. You know, in this particular film we find out that he has no idea that there are extraterrestrials; that he had never met somebody from somewhere else. He had no idea that there were people with superpowers out there, so... he’s in another learning curve. So he’s a little bit naive trying to figure out what his job is and how his job works in terms of threat prevention when kid ain’t know anything that’s happening. So... he’s making discoveries along with her discovering how powerful she is. Did you play the character differently from how you usually play him? Yeah, he can’t be as smart as he’s always been. He’s not as cynical as he gets to be when we meet him in the beginning, in Iron Man. He doesn’t have any of those qualities yet. He’s brave, but he’s not that world-weary, you know, “I’ve seen it, been there done that,” you know, doesn’t trust anybody because too many things have happened around him yet. That’s true. Also, I think right now you’re really the definitive Nick Fury. I mean, more than any comic version or cartoon version. How long do you see yourself playing Nick Fury? I don’t know. They keep writing, I keep showing up. That’s how it works. 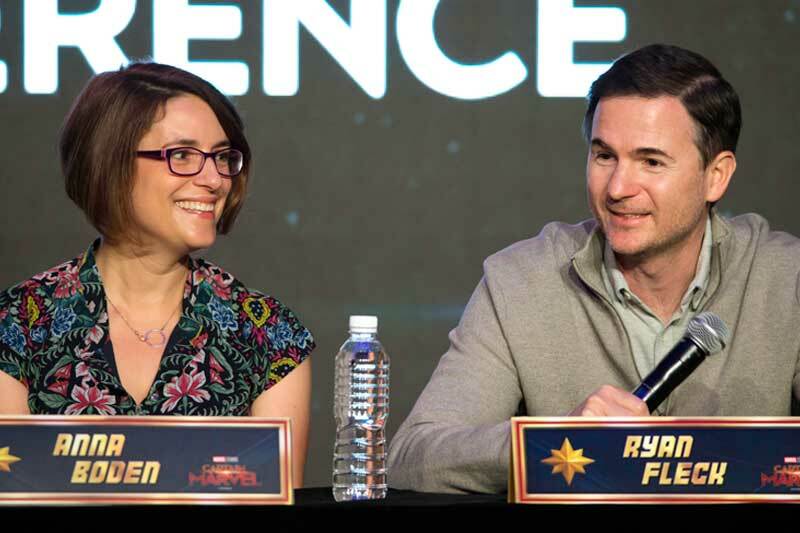 Directors Anna Boden and Ryan Fleck set out to make a character- and story-driven superhero film with Captain Marvel. She is commenting on my Sonic Youth “Washing Machine” T-Shirt, a shirt I wore on purpose because I knew her film was set in 1995, the year that album came out. An unabashedly geeky thing to do, yes, but I breathed a sigh of release that it paid off. “We were just e-mailing with him!” Boden exclaims. I should be surprised, but I’m not. Like Mike Mills, Anna Boden and Ryan Fleck have been known to do quiet little art films. Not many people have heard of Half Nelson or Mississippi Grind. If Chloe Zhao (director of the upcoming Black Widow) calls you tomorrow and says “Guys, I’ve just done indie dramas, I’m not ready for this... what do I do? How do I handle a $100 million-plus action superhero film?” What do you tell her? RYAN FLECK: Well. She hasn’t done that yet so she seems to be handling herself well, as far as I’m concerned. (To Boden): What would you say? ANNA BODEN: I don’t know. I’d say, uhh, “one piece at a time” because it’s true, thinking about the whole big thing can be really overwhelming, but it’s actually — it can be just like prepping and getting onset for any movie. It’s just one little piece at a time. And, um, once you’re there it’s just actors in a room, whatever that room is: maybe it’s the biggest that you’ve ever seen in your entire life, maybe it’s more film equipment than ever, but it’s just doing what you know how to do and also just trusting the amazing, talented team that you have and embracing them and learning from them. How does the partnership work? Do you split roles, do you just work together on everything? FLECK: Yeah. There’s not much splitting up. I mean, sometimes we have to write separately, you know, I’ll work on a certain scene and hand her the pages and she’ll work on that scene and sometimes we’ll do it together. Even when we shotlist sometimes I’ll put together a list of shots for a certain scene and then show it to her and vice versa; it’s just a lot of back and forth. And when you guys are thinking of “what’s next,” are you thinking “I’m on this Superhero Big Budget train” or do you want to go back and do the smaller films, the more intimate films? BODEN: Oh, yeah. I mean, this was an amazing experience and so rewarding. We learned so much. Umm, but you know, we also love making smaller films and more intimate films and films where there are no big explosions so I think that we’ll want to continue making all kinds of movies. You know, I’ve always been fascinated with (head of Marvel Studios) Kevin Feige’s selection process when it comes to directors. Like he’ll get the guys who’ve made a small indie film like Welcome to Collinwood and suddenly have them do Captain America. And he seems to like getting talent who are really good in smaller dramas. How was it like — the selection process, getting onboard Captain Marvel? FLECK: It was a series of meetings that we had. Phone calls, and some meetings in person. And it was just a lot of conversations about how we viewed the character and sharing some ideas about it and thankfully we were on the same page. You know, Ryan Coogler actually gave us great advice when he was prepping Black Panther. We got on the phone with him and he said “You know, if you’re going to do a movie like this— if you’re gonna go after it, you gotta make sure you love the character. You gotta make sure the story that you’re telling is a story you can live with for two years because it’s so hard and because it requires so much from you.” And we thought that was great advice because we stopped trying to think about “What does Kevin want to hear? What does Marvel want to hear from us?” And started thinking “What movie do we want to tell?” So we just started making the movie we wanted to make. Last question: can you give me 15 seconds of life advice? BODEN: One of the earlier conversations I had with Brie Larson comes to mind because we were talking about “What is strength?” and “How do you find your strength?” and “What does it mean to be powerful?” And the person who is most powerful, who is most strong, is the person who is most him or herself. It was something that one of her friends had told her and it has really stuck with me throughout this entire process and it seems like a good piece of advice to share! FLECK: I would just say, “Try to have fun.” It’s okay to be serious but try to have fun with whatever you’re doing. Gemma Chan plays geneticist Minn-Erva, one of Captain Marvel’s fellow members in the Kree Starforce. Gemma Chan is exactly her character in Crazy Rich Asians, Astrid. Poised, refined, absolutely graceful, she’s one of those actresses who wouldn’t surprise us if she became royalty. During the fan event, she came out and took the better part of an hour taking pictures with fans and signing their stuff. “I was just amazed so many people came and I didn’t want to leave anyone out,” she explains. What a class act. This must be so overwhelming coming from Secret Diary of a Call Girl and Humans to this. How different is everything? Oh, gosh. I should say I feel very, very lucky. It’s been amazing to be part of all these different projects. Each one has been a different challenge to me and I never expected to be in a Marvel film. I’m thrilled to be here and I’m excited for everyone to see the film. I didn’t recognize you at first because you had an American accent, and it was so good. How do you make a perfect American accent? Well, I’ve played a number of American characters before. And I have American cousins and I spent quite a lot of time there as a child. So for me it’s quite easy to switch. I think where we grew up in the UK we watched so many American shows and it gets in there and seeps in from quite a young age. So for me it feels really natural — just to switch back and forth. With Crazy Rich Asians you’ve become such an icon, and the representation aspect was bigger than anyone ever expected. It was such an emotional moment for all of us, seeing an all-Asian-cast film become number one. Did you expect any of this? My gosh. I... ummm. Well, thank you for saying that, I feel very lucky to be in this position and to be in that film which meant so much to so many people. And it meant so much to me and my family. I do feel sometimes a little bit of pressure. I mean, I’m not perfect so I’m not going to be a role model all the time, but I’ll do my best whenever I can; if I can speak up and help give a voice to people who have less of a voice than me, that’s what I hope to do. And I’ll try to continue doing that. So you have to hit us up. I know! I’d love to! Fingers crossed! And speaking of being the tour guide, I noticed you took Brie Larson around. How was that? Taking her to the hawker stalls in Lau Passat and everything. Yes. Well, I was so lucky when I came to Singapore to film Crazy Rich Asians, we had my local castmates and Henry Golding, they told us all the best places to go and I just wanted to pay it forward. So coming back here it’s just been amazing. And to get to show Brie some of the places where I was filming, it’s just been great. Eating the delicious food... I miss Singapore! How is this different from the other roles you’ve taken on and what did you do to prepare? Do you have a process? Well, Minn-Erva’s been a very different challenge because of the physical aspect of things. She is a very skilled warrior — she is a sniper, she’s very agile, she’s very fast. I am quite clumsy, believe it or not, so I had to do lots of training to know what I was doing with my equipment and my rifle. And just to learn all the fight sequences: that was a big challenge!